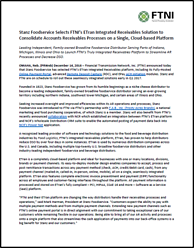 Leading Independent, Family-owned Broadline Foodservice Distributor Serving Parts of Indiana, Michigan, Illinois and Ohio to Launch FTNI’s Truly Integrated Receivables Platform to Streamline AR Processes and Decrease DSO. OMAHA, Neb. 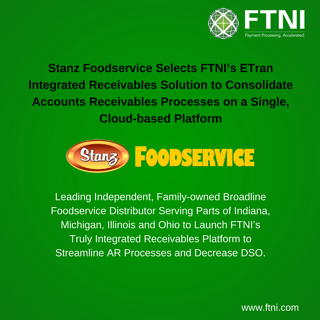 (PRWeb) December 14, 2016 – Financial Transmission Network, Inc. (FTNI) announced today that Stanz Foodservice has selected FTNI’s ETran Integrated Receivables platform, including its Fully-Hosted Online Payment Portal, advanced Remote Deposit Capture (RDC), and EPay ACH initiation modules. Stanz and FTNI are on schedule to roll out these seamlessly integrated solutions early in Q1 2017. Founded in 1923, Stanz Foodservice has grown from its humble beginnings as a niche cheese distributor to become a leading independent, family-owned broadline foodservice distributor serving an ever-growing territory including northern Indiana, southwest lower Michigan, and certain areas of Illinois and Ohio. Seeking increased oversight and improved efficiencies within its AR operations and processes, Stanz Foodservice was introduced to FTNI via FTNI’s partnership with F.A.B., Inc. (Frosty Acres Brands), a national marketing and food purchasing cooperative, of which Stanz is a member. Stanz will also benefit from FTNI’s recently announced collaboration with NCR which established an integration between FTNI’s ETran platform and NCR’s Wholesale Distribution CRM suite to enable the automated posting of payment data back into NCR’s Power Net application. A recognized leading provider of software and technology solutions to the food and beverage distribution industries by Food Logistics, FTNI’s integrated receivables platform, ETran, has proven to help distributors reduce DSO by over four days in some instances. ETran is used by numerous distribution companies across the U.S. and Canada, including multiple top-twenty U.S. broadline foodservice distributors and other industry-leading independent foodservice and beverage distributors. ETran is a completely cloud-based platform and ideal for businesses with one or many locations, divisions, brands or payment channels. Its easy-to-deploy modular design enables companies to accept, process and post remittance transactions across any payment method (check, ACH, credit/debit card, cash), from any payment channel (mailed-in, called-in, in-person, online, mobile), all on a single, seamlessly integrated platform. ETran also features complete electronic invoice presentment and payment (EIPP) functionality across all employee and customer-facing interfaces throughout the platform. All payment information is processed and stored on ETran’s fully compliant – PCI, HIPAA, SSAE 16 and more – Software as a Service (SaaS) platform. Unlike many legacy, disparate, dashboard-driven systems, ETran’s seamlessly integrated, modular design is quickly and easily configured based on unique business needs to enable the automation of AR processes and workflows—helping organizations accelerate exception handling, decrease DSO and increase cash flow. A flexible ‘plug-n-play’ platform, ETran works with existing banking and merchant processor relationships and supports efficient integration (batch or real-time) with any back-office accounting/ERP system. Stanz Foodservice is a full-line foodservice distributor, owned and operated by second and third generation members of the Stanz family. Since 1923, we have remained committed to providing operators the highest quality products and services in the foodservice industry empowered by relationships built on our key core value of integrity. Through our affiliation with Frosty Acres Brands and IFDA (International Foodservice Distributors Association), we have access to the necessary information and programs that enable us to accommodate a wide variety of foodservice operators – from small independent restaurants to large institutions and multi-unit chains. To learn more, visit www.stanz.com. Financial Transmission Network, Inc. (FTNI) accelerates the way businesses accept, process, post and manage payments. Processing millions of transactions monthly, FTNI’s integrated receivables hub, ETran, accepts any payment method, via any payment channel — on a single, secure, cloud-based platform. ETran’s user-friendly, modular design seamlessly integrates current business processes, bank and processor relationships, and back-office accounting software to deliver increased efficiencies and cost savings as a result of true straight through processing. Founded in 2007, FTNI serves more than 18,000 corporate users from leading organizations such as the American Red Cross, Benchmark Senior Living, DirectBuy, Five Star Senior Living, Independence Bank, Mutual of Omaha Bank, Penn Mutual, Physicians Mutual Insurance, Proxibid, RealPage, Shamrock Foods, The McClatchy Company and many more. For more information, visit www.ftni.com.